Located 1.9 mi from Morzine Ski School and Pléney Ski Elevator, this apartment features free WiFi. The unit is 1.4 mi from TS de la Crusaz Ski Elevator. Free private parking is available on site. Towels and bed linen are offered in this self-catering accommodations. There are 3 shower rooms. Guests have access to a sauna and hot tub located in the apartment building. Avoriaz is 9.9 mi from Le Petit Refuge Morzine, while Les Gets is 3.7 mi away. Geneva Airport is 50 mi from Le Petit Refuge Morzine. 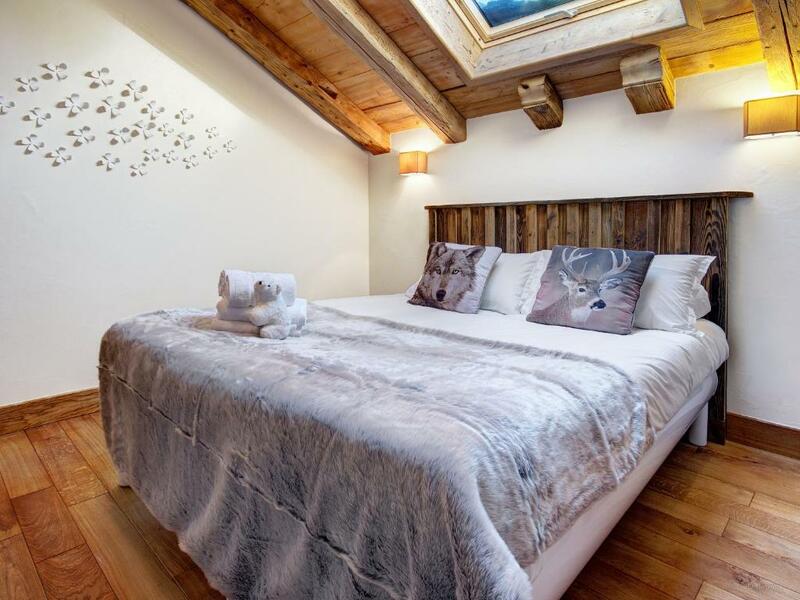 When would you like to stay at Le Petit Refuge Morzine? 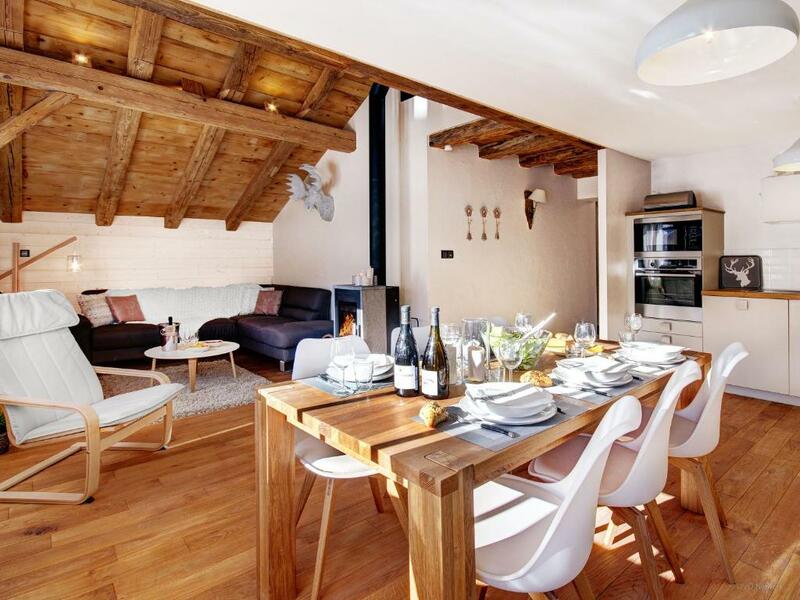 This apartment has a sofa, flat-screen TV and dining area. 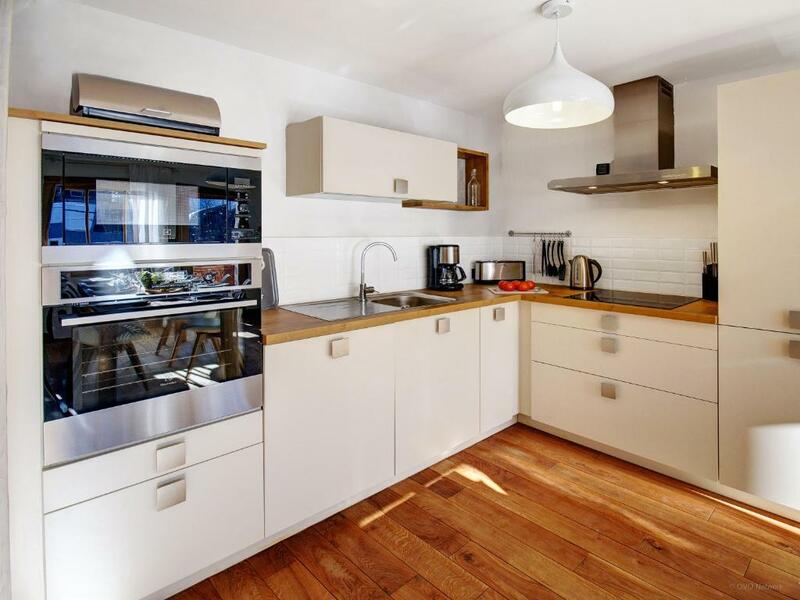 Luxury apartment in historic area close to village bars and restaurants. 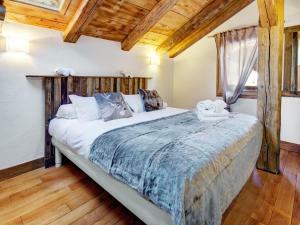 'Le Petit Refuge Morzine' is one of three newly-converted apartments in this beautiful old farm house, entirely renovated, in a historic area of Morzine. Just a few minutes drive from the centre of Morzine, it’s close enough to the bars and restaurants of Morzine to enjoy great apres-ski, but when you return to the apartment, you can relax in the indoor jacuzzi or enjoy the peace and quiet of the mountains that surround you. It’s also opposite a bakery, so you won’t have far to go for fresh bread and croissants in the morning! The ski bus stops 50m away, giving you access to all the Portes du Soleil resorts in France and Switzerland. 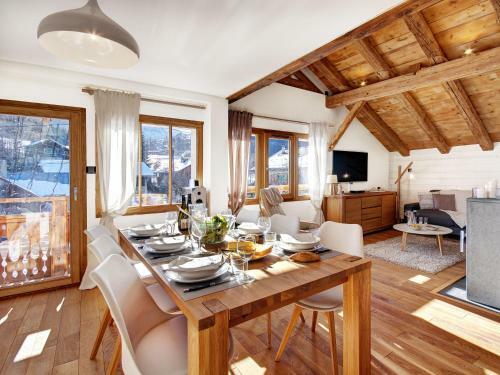 Larger groups can rent 'Le Petit Refuge Morzine' with the other apartments in the building - Le Loft (sleeps 12) and La Terrasse (sleeps 10) - and even the luxurious Villa Solaire next door, which sleeps 14. Cosy apartment with mountains of Scandinavian style. 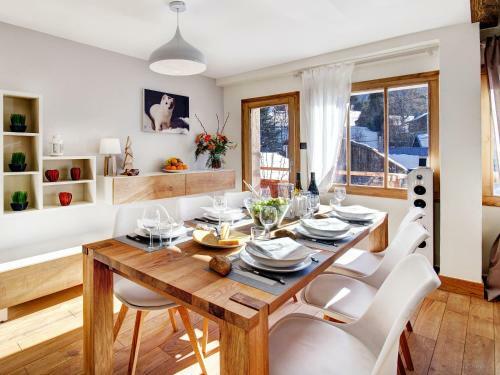 Completely renovated for winter 2013/14, the owner chose a bright and light Scandinavian style for 'Le Petit Refuge Morzine', which is on the middle floor of the farmhouse and sleeps 8. 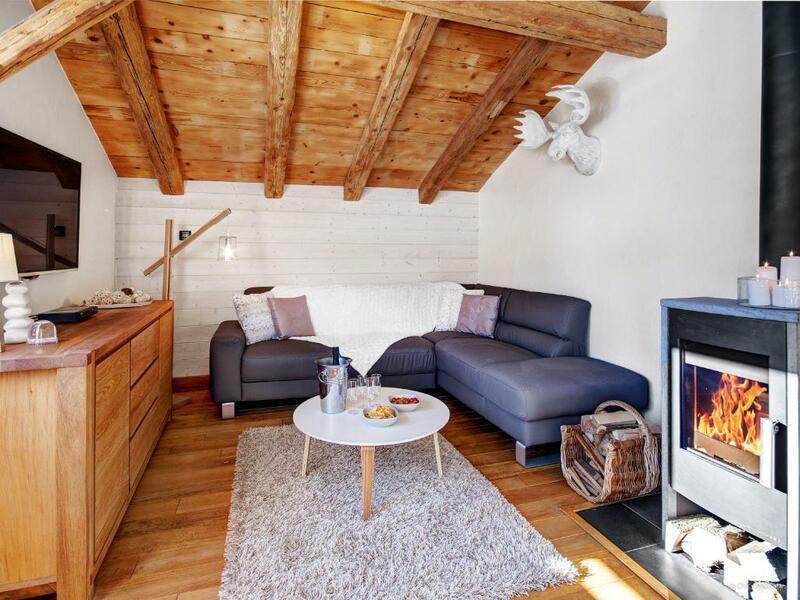 “We live in a neighbouring village to Morzine and had been looking for some land on which to build a family sized chalet for some time. One day whilst out walking around the village we came across this lovely red and white farm sporting an impressive carved shield on a wall next to a white ermine skin! We admired the unique character of the building and then continued with our walk and the quest to find our building plot. We were intrigued when visiting Morzine again several weeks later to see a “For Sale” board outside the farm, and so made an appointment to view the farm and just fell in love with the building. It hadn’t been our original intention to buy a property to renovate yet three visits and one negotiation later the farm was ours! We chose to name the property the “Refuge de L’Hermine” [the Ermine’s Refuge] as tribute to the story we were told by a neighbour explaining the history of the shield and the Ermine skin: a white ermine was being chased by hunting dogs and sought refuge in the old farm, where he ended up staying the whole winter at the farm, keeping the owner company. 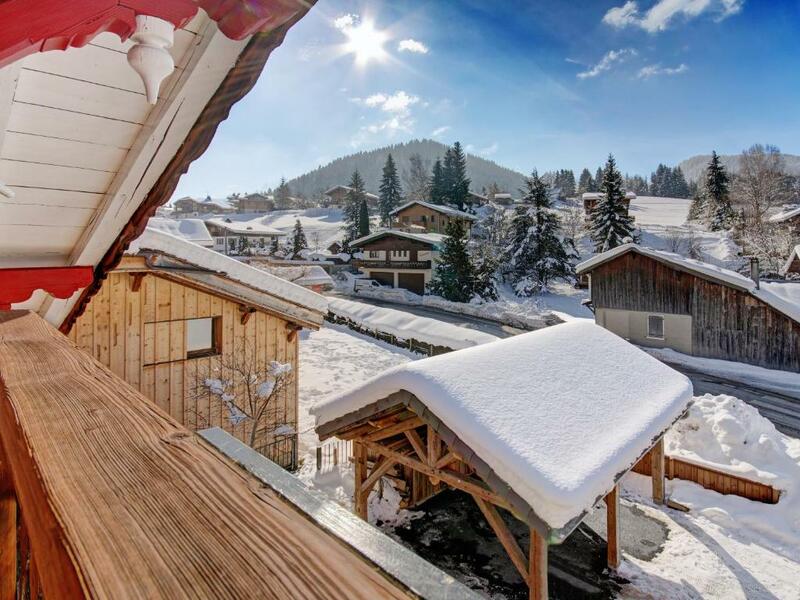 Un incroyable paradis blanc à quelques minutes de votre appartement ... Morzine se situe au coeur des Portes du Soleil et à proximité des stations populaires des Gets et Avoriaz. Avec 650 km de pistes, les fans de glisse de tous les âges et tous les niveaux ne manqueront pas d'opportunités. Vous pourrez également skier jusqu'en Suisse mais prenez garde: seuls les skieurs les plus chevronnés pourront s'attaquer au Mur Suisse, classé orange car plus délicat encore qu'une piste noire! La navette s'arrête à 50m du Petit Refuge Morzine, ce qui fait de ce luxueux chalet la base idéale pour découvrir la région. Et si vous ne skiez pas, Morzine vous propose de nombreuses activités en tout genre: sa patinoire accueille régulièrement des matchs de hockey sur glace, et le cinéma local passe souvent des films en version originale. Les plus aventureux s'essaieront au motoneige, à l'escalade sur glace, tandis que les autres auront tout loisir de profiter du paysage lors d'une balade en traîneau ou d'une randonnée en raquettes. 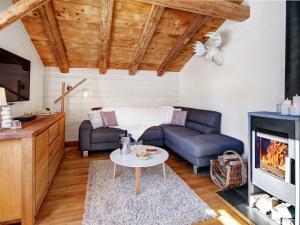 House Rules Le Petit Refuge Morzine takes special requests – add in the next step! Le Petit Refuge Morzine accepts these cards and reserves the right to temporarily hold an amount prior to arrival. Please inform Le Petit Refuge Morzine of your expected arrival time in advance. You can use the Special Requests box when booking, or contact the property directly using the contact details in your confirmation. We need at least 5 reviews before we can calculate a review score. If you book and review your stay, you can help Le Petit Refuge Morzine meet this goal. No hot water in the evenings for the first week - agents didn't appear to be bothered to fix this and no one turned up to either fix it or say sorry. Only got fixed when I formally complained to booking.com. (Booking.com have offered us compensation, but the agents refused, according to booking.com). If you have had a good days skiing you want a hot shower, not too much to ask for. Sauna light wasn't working when we arrived, this took a couple of days to get fixed. We all found the hot tub a bit cool, you can't adjust the temperature. Apartment is supposed to sleep 8 - you would need to be very, very close friends if you had 8 people in the apartment. Also, you would not all be able to eat at the same time as there are only 5 dinner plates and 2 matching wine glasses !! We found most of the rooms a bit on the cool side apart from the first bedroom as you come into the apartment. You can't control the heating at all. We ended up always having the wood burning stove on to heat the apartment, we are used to stoves, but still a bit of a hassle. Heating is all underfloor so there are no radiators to dry anything on. Sofa's / comfy seats - won't take 8 people, we found it worked well for 4. The bed at the top of the ladder in the front bedroom - not sure how anyone is supposed to safely get into or out of this bed. I wouldn't put anyone up there that I cared about. Bathrooms - it is not clear from the info on the website - but there are only TWO toilets in the entire apartment. Each bedroom has a en-suite 'bathroom', however the two rear bedrooms, the en-suite only has a shower and a sink - no toilet, don't know why as plenty of space for a toilet as well. The front bedroom has a toilet, sink and shower. The only other remaining toilet is in the hall - again if you have 8 people you will struggle. The website says the apartment is 50m from the ski bus - it is nearer 250m. Good setup for skiing with ski lockers on the ground floor and proper boot heaters (which plenty of space) on the basement floor. Good size bedrooms if you have maximum of 2 people in each room - we had total of 4 which worked well. Washing machine and tumble dryer are in the basement so easy access, however drying rack in the apartment is tiny.